Is Acne the same as rosacea? Is Acne contagious or infectious? What are signs and symptoms of acne? What else could Acne be? What medications work for acne? What should be avoided in Acne? What foods are good for Acne? What natural remedies can help Acne? What home remedy can I use for acne? Does picking at acne cause scars? Does acne get better with age? What effect can acne have on my life? Acne is a very common benign skin condition that affects many people at many ages worldwide. Acne is most common in the pre-teen to teen years (from ages 8-19). Acne is also seen from babies to seniors. The main symptoms of acne include whiteheads, blackheads, and cysts on the face, chest, back, and arms. As opposed to traditional or teenage acne, most adult patients do not easily “outgrow” acne. Acne is considered a relatively chronic (longer-term), skin condition with periodic ups and downs. Acne looks like scattered small or pinhead sized white, yellow, pink, or red bumps, and sometimes larger red cysts or lumps. Acne pictures show varying symptoms from mild white acne to severe acne with red lumps and bumps. Most people with acne do not seek professional treatment for their condition. Many people with acne assume they have to live with the condition or the acne will just pass on its own. The exact cause of acne is still unknown and remains a mystery. The basic process seems to involve plugging of small pores or hair follicles on the skin, production of excess oil, and bacterial overgrowth in the pores. Suspected causes of acne include but are not limited to genetic factors, internal hormone variations, genetics plus environmental exposure like oils, dietary hormones, and foods. Bacteria are thought to play a role in many types (but not all) of acne. . There seems to be a hereditary component to acne in a large number of people. Often people have close family members with acne. Nearly everyone can have some form of acne or acne-like rash at some point in their lives. However, acne is most common in the adolescent years where internal hormone variations cause body changes. Recently, acne is seen in much wider ages ranging from early pre-teens to late teen years (from ages 6-19). Acne is also seen in newborns as well as the elderly. Acne is not contagious or infectious from person to person. Current research doesn’t show that you catch acne from anyone or that you give it to anyone. You don’t catch acne from kissing or touching the face of someone with acne. There is overall no evidence that acne can be spread by contact with the skin, sharing towels, or through inhalation. There are however, other acne-like rashes that may be contagious like folliculitis and staph infections. Typical signs and symptoms of acne include redness, red bumps, and small cysts. The symptoms tend to come and go. The skin may be clear for weeks, months, or years and then erupt again. Acne tends to evolve in stages and typically causes inflammation of the skin of the face, particularly the forehead, cheeks, nose, and chin. When acne first develops, it may appear, then disappear, and then reappear. However, the skin may fail to return to its normal pore size and the enlarged pores and pimples arrive in time. Acne may often reverse itself in time. Acne generally lasts for years, and, if untreated, it tends to gradually worsen and cause acne scars, especially if picked with fingers. Acne is considered controllable, but not necessarily curable. Acne typically will cure on its own in most people, but acne may cause tremendous scarring in individuals prone to acne scars without proper treatment. Many people with acne have reported an almost cure with 5-6 months of oral Accutane (isotretinoin) or 2-3 cycles of “super” bluelight with a special skin kin photosensitizer ( PDT) without oral drugs. Acne is currently not considered a curable condition. While it cannot be cured, it can usually be controlled with proper, regular treatments. There are some forms of Acne that may be significantly cleared for long periods of time using laser, intense pulse light, photodynamic therapy, or isotretinoin (Accutane). Although still not considered a “cure,” some patients experience long-lasting results and may have remissions (disease-free period of time) for months to years. Acne is usually diagnosed based on the typical appearance of facial skin and symptoms of breakouts and flares. Acne is largely under diagnosed and under treated. Many people may not associate their acne symptoms with a medical condition. The bumps and lumps in Acne may be transient and come and go slowly. Dermatologists are physicians who are specially trained in the diagnosis of Acne. Generally no specific tests are required for the diagnosis of Acne. In unusual cases, a skin biopsy may be required to help confirm the diagnosis of Acne. Occasionally, a non-invasive test called a skin scraping or skin culture may be performed by the dermatologist in the office to help exclude a skin mite infestation by Demodex or bacterial infection which can look just like red or pink Acne. In rare cases, a skin culture can help exclude other causes of facial skin bumps like staph infections or herpes infections. Blood tests are not generally required in acne or rosacea but may be used to help exclude less common causes of facial blushing and flushing including lupus, other autoimmune conditions, and dermatomyositis. Medications that work for Acne include (but not limited to) oral antibiotics, topical antibiotics, benzoyl peroxide, salicylic acid, sulfa-based face washes, isotretinoin, and many others. It is important to seek a physician’s advice for resistant acne. Some types of over the counter acne medications can actually irritate skin that is prone to Acne. There are a fair number of people that are allergic to benzoyl peroxide products like proactive and Clearasil. Allergies to benzoyl peroxide may cause intermittent swelling of the upper eyelids or a “frog eyes” swelling of the eyelids without drainage or pus. Overall, red Acne type skin tends to be more prone to rosacea, and more sensitive and easily irritated than that of common acne. What is used for treating Acne? There are many treatment choices for Acne depending on the severity and extent of symptoms. Available medical treatments include antibacterial washes, topical creams, antibiotic pills, lasers, pulsed-light therapies, photodynamic therapy, and isotretinoin. Mild Acne may not necessarily require treatment if the individual is not bothered by the condition. More resistant cases may require a combination approach, using several of the treatments at the same time. A combination approach may include home care of washing with a medicated wash twice a day, applying an antibacterial cream morning and night, and taking an oral antibiotic for flares. A series of in-office laser, intense pulsed light or photodynamic therapies may also be used in combination with the home regimen. It is advisable to seek a physician’s care for the proper evaluation and treatment of severe or resistant Acne. With proper treatment, Acne symptoms can be fairly well controlled. Popular methods of treatment include topical (skin) medications applied by the patient once or twice a day. Topical antibiotic medication such as benzoyl peroxide or clindamycin applied one to two times a day after cleansing may significantly improve Acne. Azelaic acid (Finacea gel 15%) is another effective treatment for patients with Acne. Some patients elect combination therapies and notice an improvement by alternating metronidazole and azelaic acid: using one in the morning and one at night. Sodium sulfacetamide (Klaron lotion) is also known to help reduce inflammation. Other topical antibiotic creams include metronidazole (Metrogel) and clindamycin (Cleocin). Oral antibiotics are also commonly prescribed to patients with moderate Acne. Tetracycline, doxycycline, minocycline, and amoxicillin are among the many oral antibiotics commonly prescribed and they actually help reduce inflammation and pimples in Acne. A newer low dose doxycycline preparation called Oracea 40mg once a day has been used in Acne. The dose may be initially high and then be tapered to maintenance levels. Common side effects and potential risks should be considered before taking oral antibiotics. Short-term topical cortisone (steroid) preparations of minimal strength may in occasional cases also be used to reduce local inflammation. Some mild steroids include desonide lotion or hydrocortisone 0.5% or 1% cream applied sparingly once or twice a day just to the irritated areas. There is a risk of causing an Acne flare by using topical steroids. Prolonged use of topical steroids on the face can also cause Perioral dermatitis. Many doctors prescribe tretinoin (Retin-A), tazarotene (Tazorac), or adapalene (Differin) which are prescription medications. Over the counter retinoids and retinol creams may also work well for acne. Isotretinoin is infrequently prescribed in cases of severe and resistant Acne. Often it is used after multiple other therapies have been tried for some time and have failed. It is used as a daily capsule for 4-6 months. Isotretinoin is not typically used in mild Acne and it is most commonly used in the treatment of severe, common acne called acne vulgaris. Close physician monitoring and blood testing are necessary while on isotretinoin. Typically at least 2 forms of birth control are required for females on this medication and pregnancy is absolutely contraindicated while on isotretinoin. In addition, prescription or over-the-counter sensitive skin cleansers may also provide symptom relief and control. Harsh soaps and lotions should be avoided, whereas simple products like low strength benzoyl peroxide cleanser may be very effective. Patients should avoid excessive rubbing or scrubbing the face. Many patients are now turning to laser and intense-light treatments to treat the acne scars and resistant acne. Often considered a safe alternative, laser and intense pulse-light therapy may help to visibly improve the skin and complexion. Laser treatment may cause some mild discomfort. While most patients are able to endure the procedure, ice packs and topical anesthetic cream can help alleviate the discomfort. Multiple treatments are typically necessary and the procedure is not covered by most insurances. Treatments are recommended in three- to six-week intervals; during this time, sun avoidance is necessary. Risk, benefits, and alternatives should be reviewed with your physician prior to treatment. Laser treatments may be combined with photodynamic therapy (light-activated chemical using photosensitizers like Metvixia) for more noticeable results. Photodynamic therapy (PDT) is one of the newly available treatments. PDT uses a topical photosensitizer liquid that is applied to the skin and a light to activate the sensitizer. Levulan (aminolevulonic acid) and blue light, commonly used to treat pre-cancers (actinic keratosis) and acne vulgaris, can also be used to treat some Acne patients. The use of PDT in Acne is considered off-label use to some extent, since it is primarily designed for regular acne. PDT is thought to work at reducing the inflammation, pimples, and also improving the skin texture. PDT is an in-office procedure performed in your physician’s office. The treatment takes anywhere from one to one and a half hours to complete. Strict sun avoidance for approximately one to three days is required after the treatment. Mild discomfort during the treatment and a mild to moderate sunburn appearance after the treatment is common. Some patients have experienced remissions (disease free periods) of several months to years from these types of treatments. Other patients may not notice significant improvement. Glycolic-acid peels may additionally help improve and control Acne in some people. The chemical peels can professionally be applied for approximately two to five minutes every two to four weeks. Mild stinging, itching, or burning may occur and some patients experience peeling for several days after the peel. Any peel can irritate very sensitive skin and cause flares for some people. Peels should be used with caution in Acne as not everyone is able to tolerate these treatments. Potent cortisone or steroid medications on the face should be avoided because they can promote acne formation on the face. Some patients experience severe Acne flares after prolonged use of topical steroids. Proactiv is just an over the counter and widely marketed product with the simple ingredients of benzoyl peroxide and salicylic acid. Proactiv does not have any prescription ingredients of antibiotics. Essentially, using an over the counter combination of a benzoyl peroxide wash and a salicylic lotion and wash would work similarly to Proactiv. Basic good and healthy diet foods like fresh fruits and vegetables are potentially good for acne. A balanced diet free of fats, hormonally fortified dairy and processed foods is recommended for overall better health. Ayurvedic medicine suggests possible Aloe as a cooling agent for acne. Foods that may potentially help avoid some Acne flares include non-dairy sources of milk and cheese, and organic meats and poultry. Some studies have suggested the possible role of hormone supplemented milks and dairy products in acne. Overall, studies have been largely inconclusive as of to the exact role of diet in acne. Not all dermatologists are convinced of the exact dietary roles in acne. The data on food causes of acne seem to change every 5-10 years. Acne skin tends to be unpredictable and may easily flare with self treatment or common acne therapies. Any home treatment or attempts for natural remedies should be approached with mild caution. As with any Acne therapy, some people may experience sensitivity or irritation with treatment. Several possible natural acne remedies include dilute vinegar cleansing and green tea applications. Dilute white vinegar facial soaks or cleansing daily or weekly using approximately 1 part regular table vinegar to 4-6 parts water may be helpful. Vinegar is thought to help as a natural disinfectant and can help decrease the number of yeasts and bacteria on the skin. Since vinegar may rarely flare Acne in some people, a small test area should be tried before applying to the entire face. Green tea soaks to the face may also help decrease the redness and inflammation seen in Acne. Green tea is thought to have anti-inflammatory properties. A few commercially available products also use green tea as the active ingredient. Yes. Although Acne has a variable course and is not predictable in everyone, picking tends to cause temporary acne discoloration and possible permanent acne scars. Fortunately, acne scars that are not ice picks or sunken in are temporary and improve with sunscreen and topical fading creams like hydroquinone. Pitted or ice pick Acne scars are very difficult, if not impossible to treat. Most teenagers’ acne does eventually get better with age. Adult women acne (ages 30-50) can continue for years and often doesn’t remit on its own. Newborn acne also gets better past the newborn stage and possibly after the maternal hormones clear out of the infant’s system. Proper skin care involves using an antibacterial cleanser to wash the face twice a day. Over-washing may cause irritation. A sunscreen lotion is advisable each morning. Your physician may prescribe a topical antibiotic to use once or twice a day under your sunscreen. Overly rubbing the face tends to irritate the reddened acne skin. Some cosmetics and hair sprays may also aggravate redness and swelling. Facial products such as soap, moisturizers, and sunscreens should be free of oils or other overly irritating ingredients. Moisturizers should be applied very gently after any topical medication has dried. When going outdoors, sunscreens with an SPF of 15 or higher are helpful. Most acne “scars” are really temporary acne discoloration and will gradually clear. Acne scars if pitted or ice pick type are nearly impossible to clear. Simple oil free, cover-up makeup can be used for active acne. There are some green-based moisturizers or tinted foundations that may help conceal the redness. Acne scars can be treated at home with a combination of retinoid creams (Retinol) over the counter, and vacubrasion (vaccubrasion) to help stimulate the collagen and lift off the dead skin layers. Moderate to severe Acne scars often require medical treatment in your dermatologist’s office with a laser, intense pulse light, or minor surgery to remove the depressed scars. Usually, multiple treatments are required for best results and only a portion of the acne scars may be improved with each treatment. Not everyone responds the same to these types of treatments, and your dermatologist can help you decide which treatment is best for your skin type, condition, and type of acne scars. Acne may affect your life minimally, moderately, or severely depending on how active the condition is and your overall tolerance of the acne skin symptoms. Some people with acne have absolutely no symptoms and are not bothered at all by their acne. They may enjoy perfectly healthy normal lives without any effect from this benign but often troublesome skin condition. Some people with acne may not even know they have a medical condition called Acne. They may not want to use any acne treatments. People with moderate Acne may have periodic flares that require treatment with oral antibiotics, lasers, and other therapies. They may continuously take an antibiotic daily for years and years to keep their acne symptoms under control. Many of these people may complain of embarrassment from the breakouts and blemishes of Acne. They may have ups and downs and times that their acne is quiet and other times when it feels like their acne is on fire. With the help of their dermatologist, these patients can learn the pattern of their Acne and develop a treatment plan to keep it from interfering in their daily lives. 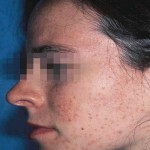 Other patients have very bothersome Acne that causes them issues on a daily basis. There are subsets of severe Acne sufferers who have extreme psychological, social, and emotional symptoms. Some have developed social phobias causing them to cancel or leave situations when their Acne is flaring or active. Although Acne is not a grave medical situation, severe cases may wreak havoc in some patient’s lives. It is important for these patients to discuss their physical and emotional concerns with their physicians and to get professional help from a dermatologist in treating their Acne. Overall, promptly diagnosed and properly treated, Acne should not prevent people with the condition from enjoying undisturbed lives. For more information on Acne, you may wish to contact The American Acne Foundation at www.Acnefoundation.org (AAF). Support information and research updates may be regularly available from AAF. The American Acne Foundation provides links for home acne treatment kits, skin care products, and may also sponsor acne treatment grants and studies on Acne treatment. The National Institutes of Health (NIH) is a United States funded government organization with excellent information on acne and recent acne research and acne clinical trials. Acne symptoms tend to come and go. Acne commonly affects the central third of the face, especially the nose. Acne causes tiny red, tan, or pink pimples on the facial skin. Acne can be a very bothersome and embarrassing condition. Untreated Acne tends to worsen over the time and be a progressive disease. Prompt recognition and proper treatment permit people with Acne to enjoy life more fully.